The latest water quality tests reveal Clark Lake to be in good condition, but not without some concerns. There are test three categories—water clarity, amount of phosphorus (stimulates plant/algae growth), and the amount of chlorophyll (indicates the amount of plant/algae growth). These three are sometimes connected. More phosphorus can stimulate algae and plant growth (chlorophyll). More chlorophyll can make the water less transparent. The most recent test confirms a trend line showing less chlorophyll which is a good thing. The news was mixed on phosphorus. The spring test was in line with previous years. The summer test showed more of it. In spite of less chlorophyll, the results confirm the trend of less transparency. What can be done? Phosphorus speeds up the aging process and is found in many fertilizers. Stop its path to the lake and you slow the aging process. Every fertilizer displays three numbers. The center number is phosphorus. 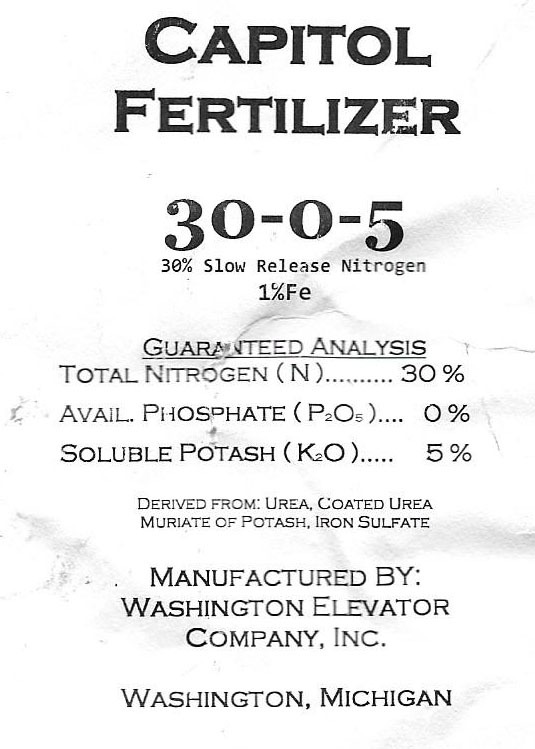 The illustration shows the content of a fertilizer sold in this area. The first number on the label is nitrogen; the second, phosphorus; and the third, potassium. If you’re looking to say “no” to phosphorus, simply look for a “zero” middle number. Also recommended is to keep fertilizer away from the shoreline and/or drains that empty to the lake. Each year the waters of Clark Lake are tested multiple times to ensure that our lake is in good condition. The testing has been done in recent years by Carolyn Zader, who volunteers her time. The lab costs have been borne by the Clark Lake Community Center. Testing continues through the summer, so the latest test results are from the previous year. The 2015 results aren’t a perfect 10, but they show that Clark Lake is in significantly better shape than other lakes that were tested in Michigan. But that should surprise no one here! There are test three categories—water clarity, amount of phosphorus (stimulates plant/algae growth), and the amount of chlorophyll (indicates the amount of plant/algae growth). Transparency measures how clear the water is. 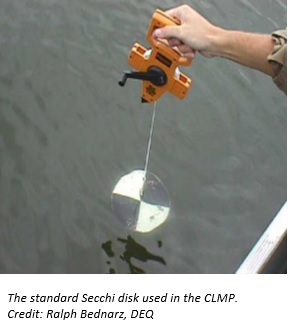 The deeper you can see the test disk (known as a secchi disc—see illustration), the better. The nine tests in 2015 show the average depth was 13.6 feet. The 43 tests between 2010-2014 and 1982-2009 results averaged 14.1 feet. The half-foot difference is not considered statistically significant. 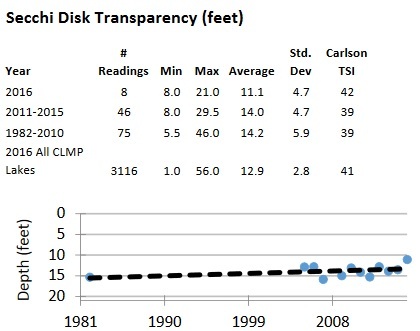 Clark Lake does better than the average of all lakes tested for transparency–12.6 feet. Phosphorus stimulates plant growth, leading to eutrophication. Phosphorus is monitored once in the spring and once in the summer. Spring phosphorus was 8 parts per billion in 2015, up from the 2010-2014 average of 6 ppb. A smaller number, indicating less phosphorus, is preferred. The summer phosphorus in 2015 was 10 ppb, up from 8 ppb in spring. The summer number was also greater than the 2010-2014 average of 8.8 ppb. Both spring and summer measures for Clark Lake were considerably less than the average of other Michigan lakes—spring 11.5 and summer 13.2, and that’s good for us. 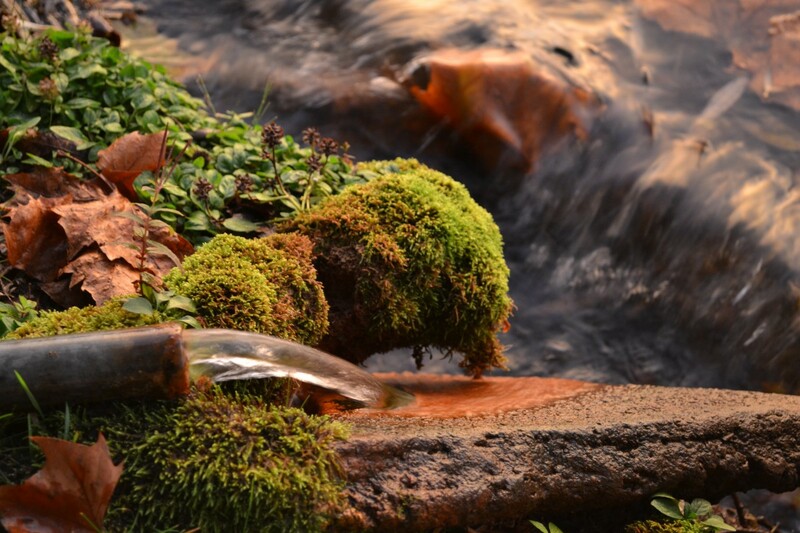 Chlorophyll measures the concentration of small plants in the water, such as algae. Lower numbers are better. 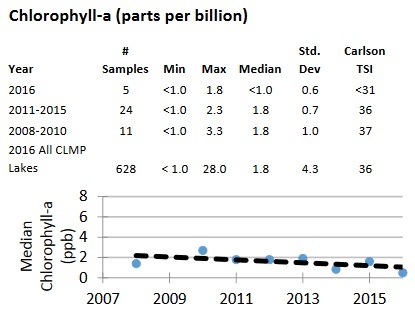 Chlorophyll was up slightly from 2014, but since 2009, it has been trending down. Again, Clark Lake scores better than the average. In all, the results for Clark Lake look good, but not straight A’s. What can be done? Phosphorus speeds up the aging process and is found in many fertilizers. Stop its path to the lake and you slow the aging process. Also recommended is to keep fertilizer away from the shoreline and/or drains that empty to the lake (there are several drains like this around the lake them). After a number of years of faithfully performing these tests, Carolyn Zader would like to retire. Do you know of anyone who can take over this important work? If so, please email [email protected]. Carolyn Zader lives on the north side of the lake near Pleasant View. Every year Carolyn Zader performs a series of tests on the waters of Clark Lake. Five months of each year, she gathers samples that are shipped to a lab for testing and takes readings on water clarity. The water samples are tested for their content of phosphorous and chlorophyll. The less of it found in the lake, the better as both substances contribute to aging the lake. 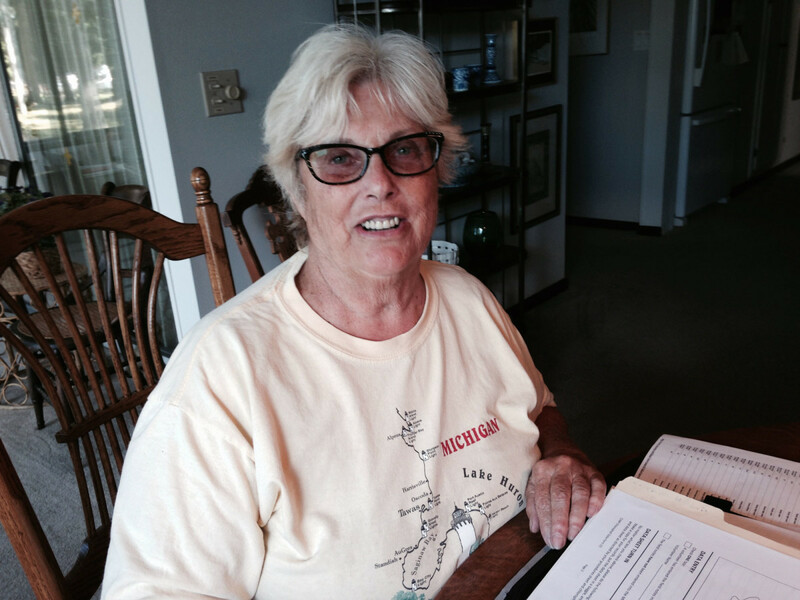 Like many at the lake, Carolyn is a volunteer and she devotes significant time and effort to this project. Below is her report on the water of Clark Lake for 2014 (since testing is going this summer, we’ll see the 2015 report next year). After comparing scores of the last four years of the health of our lake, it appears we are heading in the right direction. A worthy goal is to slow down the eutrophication of our lake. Eutrophication is the filling in of our lake with runoff and sediment. A direct human effect on the process is the use of fertilizers, especially those with phosphorus. Phosphorus free fertilizers are available and easy to find, so if you feel you must fertilize, use the phosphorus-free and you will be helping to keep our lake healthy. Lakes are classified based on their productivity. Low productive lakes with deep clear water and little aquatic plant life that support cold water fish are known as oligotrophic. As you add plant life and less depth, next is mesotrophic followed by eutrophic. A shallow, weedy, mucky lake is hypereutrophic. So how is Clark Lake classified? The answer lies in the tests we conduct. The range for transparency is 25 – 64. The mean score for a healthy mesotrophic lake is 41. Our 2014 score was 39. The range for phosphorus is 27 – 66. The mean score for a healthy mesotrophic lake is 39. Our score for 2014 was 41. The range for chlorophyll is 31 – 61. The mean score for a healthy mesotrophic lake is 39. Our score for 2014 was 31. Good. So, measured against other lakes, ours is, on the whole, pretty healthy. With an overall average TSI score of 40 based on all three tests, Clark Lake is rated as between the oligotrophic and mesotrophic lake classification. The lake leans slightly more more meso than oligo. Carolyn Zader reports that the latest test of Clark Lake water shows improvement over the previous year. The test measures three characteristics–transparency, phosphorus and chlorophyll. The amount of phosphorus detected was way down, which is the area of greatest improvement. Transparency also was better. Carolyn has tracked Clark Lake’s water quality–using the same metrics–over a period of years. To read Carolyn’s report that includes a five year perspective, please click here. Comparing the last five years scores of the health of our lake, we continue to head in the right direction. We complete three tests for water quality: transparency, phosphorus and chlorophyll. Lakes are scored using what is known as the Carlson’s TSI Score. The range for transparency is 25 – 64. A higher score is better, and the mean score for a healthy lake of our type is 41. Our score for 2009 was 37, 2010 was 41, 2011 was 39, 2012 was 38; and the latest score, 2013, was 40. The range for phosphorus is 27 – 66. For this measure, a lower score is better. For a healthy lake of our type, the mean score is 39. Our score for 2009 was 36, 2010 was 34, 2011 was 30, 2012 was 39 and our most recent score was 30, which is way down! The range for chlorophyll is 31 – 61. A lower score is better and the mean score for a lake of our type is 39. Our score for 2010 was 40, 2011 was 36, 2012 was 36, and for 2013 37 (up one point). The drop in phosphorus is especially encouraging. So, our lake is, on the whole, looking better.